Did you know that on January 27th the value of the Singapore Dollar dropped by the greatest amount in a single day since 2010? A few days ago the financial press globally were startled into reporting that our currency had suddenly depreciated. Yesterday MAS put up a belated official announcement explaining that it had been a deliberate policy move. I’d like to take a closer look at this monetary easing and show you why it will lead to Singaporeans getting shortchanged unless it is accompanied by fiscal easing and how ultimately disastrous the PAP policy of relying on exports and overseas investment is. I will show how it links to immigration policy, forced CPF savings. health care and so on. I will demonstrate that the only solution is to re-balance the economy towards domestic consumption. What is monetary easing good for? Monetary easing, often referred to as quantitative easing, or QE (as the policy of monetizing government debt and other financial assets through open-market purchases by the central bank is called) has been billed as a tool to fight deflation. For the purposes of this post you will have to accept that deflation is a bad thing and to be avoided. If you want to know more or disagree just drop me a comment and I will be happy to respond. Why did MAS take the step of Monetary Easing ? Naturally financial analysts have focused on the move by MAS as part of a strategy to fight deflation. This is the same reason given by the Japanese and European central banks on why they embarked on massive monetary easing. The MAS’s own announcement states the reason is an attempt to slow the Singapore dollar’s appreciation against a basket of currencies. 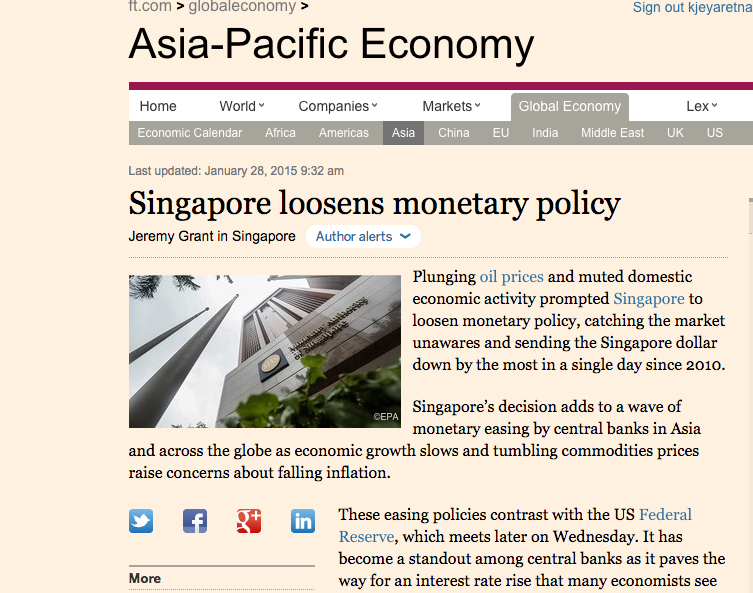 So everyone agrees that MAS has got us into monetary easing in order to fight deflation. In fact our currency immediately responded to the QE by dropping roughly 1.5% against the US dollar and is expected to fall further. We will know more on Monday. So if our currency is dropping what’s wrong with Monetary easing? Because monetary easing on its own is unlikely to be effective except insofar as it weakens your currency and boosts exports. The problem is that QE needs to be accompanied by a more expansionary fiscal policy aimed at boosting domestic demand. As you depress the currency value on one side of the equation you must balance it by pumping up the domestic demand on the other. Back in the 1930s Keynes already said that a monetary policy easing unaccompanied by fiscal measures was unlikely to be effective in stimulating demand and getting an economy out of recession. Also you cannot keep your currency depressed for ever without incurring costs which mount over time. Why are people talking about Currency Wars? By deciding it can no longer sit back and let other exporters like Germany and Japan gain a trade advantage by depreciating their currency MAS has joined the currency wars. Make no mistake, the latest rounds of QE, accompanied in Japan by tax increases and in Europe by German demands for similar measures in other Eurozone countries, are not really about increasing domestic demand,no matter what they claim. They are called currency wars because it’s about the battle over the export market. It is a move by the countries involved to gain an unfair competitive advantage by making their export goods cheaper. It’s just an old-style currency manipulation exercise aimed at beating export competitors (South Korea and China) and gaining a bigger share of the US market, which is the only one still growing. For now. We cannot rely on US growth. If all these countries depreciate their currencies and get a bigger share of US exports they actually detract from US growth because they are not importing equal amounts from the US. By pushing exports over imports they accumulate reserves, the bulk of which are invested in low-yielding Government securities, which become worth less and less over time. These wars are actually subtracting from US growth (which the Americans are unlikely to tolerate indefinitely) and exerting a deflationary impact on the rest of the world. Ultimately the US has the option of going bust (though more a theoretical possibility than an actual one) or imposing negative yields on foreign holdings of its currency like Switzerland. All those countries with a claim on them via Treasury bonds in the reserves will be royally shot in the foot. What do you mean by fiscal easing? When I say fiscal easing I mean moves to boost domestic consumption, that is spending more or collecting less by cutting taxes. The PAP have a mercantilist mindset. Running a big current account surplus and accumulating reserves is part of the mercantilist mindset that also sees exports as good and imports as bad. To the mercantilist, there can never be too much investment and the less domestic consumption there is the better. Since the 1970s there has been a huge drag on world growth caused by the desire of mercantilist nations to run big current account surpluses and accumulate reserves. First it was Japan in the 1980s and then South Korea and China, particularly after the Asian financial crisis of 1997. Germany also has a mercantilist mindset. In the past the PAP has expressed views that there is no point in increasing domestic consumption, as it will all be spent on imports. As I said before if everyone together tries to reduce domestic demand and increase exports simultaneously the end-result will be a worldwide slump. The result of a much bigger accumulation of reserves is that the returns from these reserves over the long run fall to such a low-level that it would have been better if the surplus countries had spent it on consumption in the first place. Add in the fact that we are probably poised on the cusp of an era of accelerating productivity growth with automation and artificial intelligence and a strategy of hoarding reserves in ever-increasing amounts for a “rainy day” that never comes makes no economic sense. How is this relevant to the Singapore context? The immediate effect of our currency depreciation will be to make overseas travel or study less attractive in particular to the US and imported goods may become more expensive such as the costs of fuel but Singapore and Singapore housing in particular will start to look very attractive to overseas investors. Many of the PAP’s economic policies are aimed at running a large current account surplus and accumulating reserves. The Government runs a budget surplus (on the correct IMF format and not the misleading one presented to Parliament as part of the annual Budget farce) of about 8-10% of GDP. That is very large indeed and means that the reserves are rising by about 10% every year. At our stage of development such a high rate of savings is unnecessary and means we forego a higher level of consumption. Taxes on the middle and lower classes and prices for a range of products that we are forced to buy from government monopolies are higher than they should be. Spending on health, education, children and the elderly is kept down despite the fact that the first three items at least would yield higher rates of return than our SWFs are able to generate on our foreign reserves. (I have since 2012 questioned the returns that Temasek and GIC are achieving and some of my many articles are listed via links at the bottom). What can be done instead of QE? The Government could allow the Singapore dollar to appreciate thus cutting the cost of imported goods and raising the real value of our wages. If the Statistics Department measure of overall unemployment at 2% and citizen unemployment at 2.9% is accurate then the economy is operating at full capacity. By keeping the Singapore dollar artificially undervalued the PAP Government are acting contrary to their stated policy of encouraging Singaporean manufacturers and producers to raise productivity and move up the value chain to higher value-added products. Decreasing the currency by QE is actually subsidising producers discouraging productivity and imposing a forced real wage cut. This is the clearest sign that despite the lip service paid to productivity the PAP Government is returning to the only growth strategy it understands and finds easy to implement: low value-added service and manufacturing industries based on cheap foreign labour. The Government should also loosen the fiscal austerity that it has practised for so long and spend more on domestic programmes like health, education, families and the elderly. At the moment the Net Investment Returns Contribution which is supposed to be used for current spending is instead saved in a round-tripping charade which I have called “Smoke and Mirrors in the Government’s Accounts”. We can spend at least another $10 billion a year on social programmes without denting the reserves if the Government is being honest about GIC’s and Temasek’s returns. As for housing I have often warned here of the dangers of a housing bubble when everyone gets excited over the rising value of their property. Government measures to cool the market did just that and now this latest currency depreciation move will reverse that and prices will go up again. There is one other possible reason why the Government has chosen the path of currency depreciation. It has to do with our secretive Sovereign Wealth Funds with Temasek headed by the Prime Minister’s wife whilst he himself heads up the board of GIC. Depreciating the Singapore dollar would very effectively offset losses or bolster returns generated from the assets of our SWFs invested in foreign currencies. The last public Statement of Assets and Liabilities at 31 March 2013 showed total Government assets net of cash held with MAS of around $650 billion. All of GIC’s assets are external so currency depreciation will have the automatic effect of increasing returns denominated in Singapore dollars. The same goes for Temasek. Even the value of their holdings in Singapore equities will also go up if the Singapore dollar depreciates depending on how much the companies export. 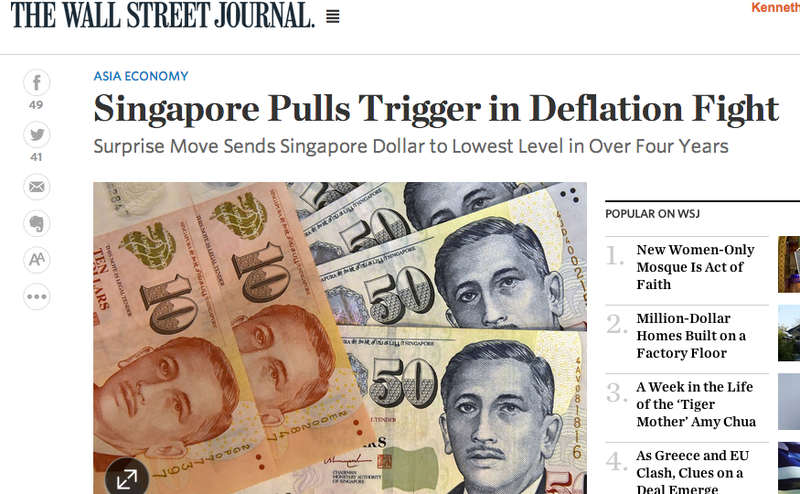 The Singapore dollar has already fallen by some 8% since June 2014 which will artificially boost the returns achieved by Temasek, GIC and MAS when translated back into Singapore dollars. We do not know how Ho Ching is paid but it seems safe to assume that higher returns will result in her receiving a higher bonus. So not only is the PAP Government cutting the value of your wages by an unnecessary and counterproductive currency depreciation. It is cutting the value of your CPF savings too. This demonstrates, as I have always said, that the risks of Temasek and GIC will not be borne by the managers, including the PM’s wife. They will instead be borne by Singaporean CPF holders and taxpayers. Garbage City : brought to you by monkeys. Question about CPF. CPF inflows and outflows are in SGD, but It was recently “revealed” by the government that the funds are converted by MAS to foreign reserves and managed by GIC. Does this process not generate needless FX risk? But then, by deliberately deflating SGD, does this mechanism not give the government an easy profit than can be used to pay back the CPF liabilities in SGD?